It's a new year and time for resolutions of sorts. Wondering about my top priority for 2019? Here's your show. You know, "2019" seems to roll off the tongue pretty well. My wife was trying to get our Alexato play the podcast and she discovered that it's hard to find this "Ericast" but there's at least one other "Eric Cast" out there. But I'm pretty sure I'm the original. I know at least one other person listens to the Dweeb Thoughts feed, so in 2019 I might try to be more regular about that. Also, I'll do fewer personal details (I think, maybe?) because I noticed when going through the back-catalog that it's hard to get to the meat of a podcast topic while slogging through the basics of my life. That won't change for the nearly 14 years of back-catalog on the podcast, but maybe it'll be better in the next 14 years. Listener feedback will still be key to the Ericast. It's one of the best features of Seth Godin's "Akimbo" podcast so I'd like to keep that up here. Closing with the life updates rather than opening with them (because you didn't think they'd disappear entirely, would you?) I have a weird problem where something is syncing old photo collections into my Photos directory, which causes my fairly small SSD drive to fill up, which causes Windows 10 to turn on automatic compression so it can function. Very odd. So I'm declaring auto-syncing bankruptcy right now and am uninstalling Google Drive (that was easy) and iCloud (which is taking forever... leading me to wonder if that's what was causing the syncing problem). Stay tuned to find out more. As always, share your thoughts. Next week I think I might talk about what's on my podcast roster for 2019 -- I did that before but it's been a few years now, and tastes change. Questions? Problems? Worries? Call 701-645-3742, email me (eric) at ericast.com, or reach out on social media. I've always promised to mix in a bit of theology into the Ericast, and this is one of those episodes. Regular listeners will love it. Some in the "silent majority" might not. But I really, really believe in this message. Here's your show. Anyway, this episode talks about the importance of Grace and Forgiveness. Sure, sure, we know it's important. No, it's really important. Agree? Disagree? Comments in general? You know what to do. I'd love to hear from you. Sometimes a book really affects you... and here's one example, with the twist of a really strange timeline. Curious? Here's your show. It's been awhile. And it's was quite a summer, and quite a fall. Thanks for sticking with me... Or for joining the Ericast family for the first time. Sorry I still haven't figured out my room noise. Maybe that's what kept me away from the mic. I'll try to change that. 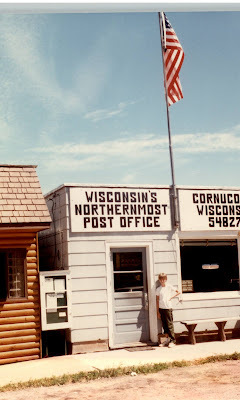 Starting when I was 11, I spent my summers in Cornucopia, Wisconsin -- and lived up there year-round from age 16 to 18. Had I not been homeschooled, I would have turned the graduating class of the consolidated school district from 13 to 14 people. Lots of stories there. By the time Warday had come out in 1984, I had started a club called "Kids For Peace". I knew about the issue of nuclear proliferation before Special Bulletin and The Day After and Threads. And I don't think that the following generation -- the "late Gen-X" born in the early 80s -- really understand what it was like to live under the thread of a Soviet nuclear attack. Anyway, I had never heard of the book, but with some trepidation (simply because it was spooky) I watched Warday pass on October 28, 1988. And that, was exactly 30 years go. If this timeline starts to sound messed up, it's because it is. And it's explained in a Warday review I found thanks to Google, from Mitch Edgeworth. He does a better job than I could, so I read it. Thoughts? Reflections? Reach out at 701-645-3742 or any of the usual Ericast venues. Huh. It's been 300 episodes since the Ericast started in March of 2005. Want me to say something about that? Here's your show. I'm still here, so are you, and I think we both appreciate both of those facts! 701-645-3742 is the listener feedback line even though I don't put much of that feedback in the show anymore, but we'll see how we do. Can't find my July episode on the computer but it apparently happened. I said it was in "Studio A" so it should be on this computer. And the theme was "Everyone is quitting..." but I'm not. I promised that I had nothing special planned for this episode, and I keep my promises! Since the July 1st episode that apparently happened, I went to Colorado and I have plans for Studio D. It's been a good, full Summer, with more ahead for Fall. Questions? Ideas? Give a call at 701-645-3742 or reach out any other number of ways.